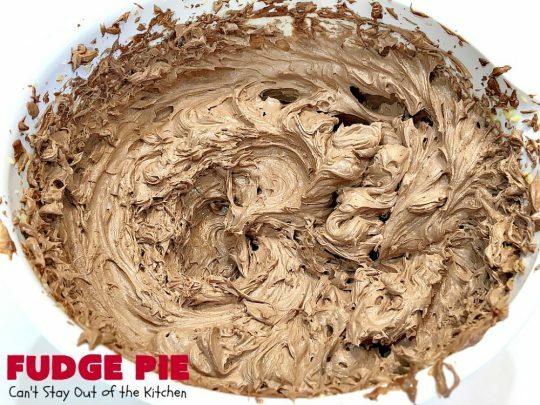 Fudge Pie is absolutely awesome. 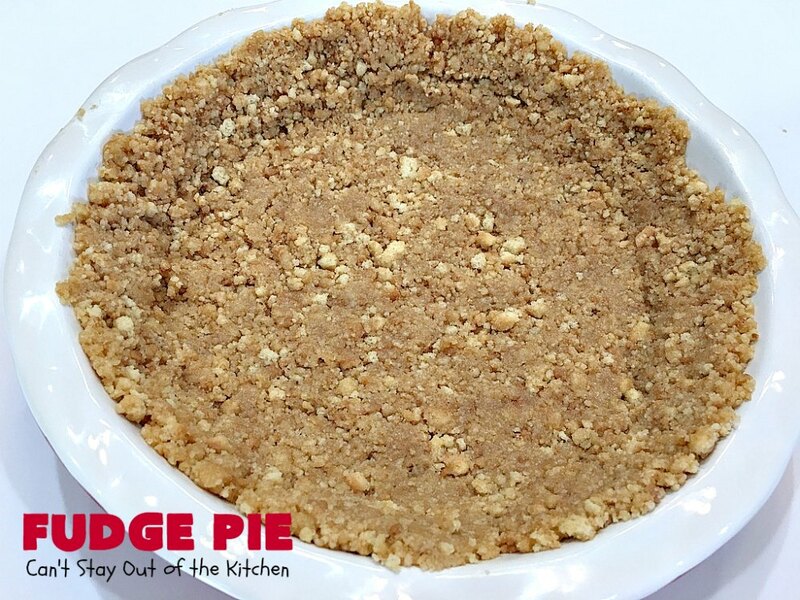 I mean awesome with a capital “A.” This lovely pie has a shortbread crust. 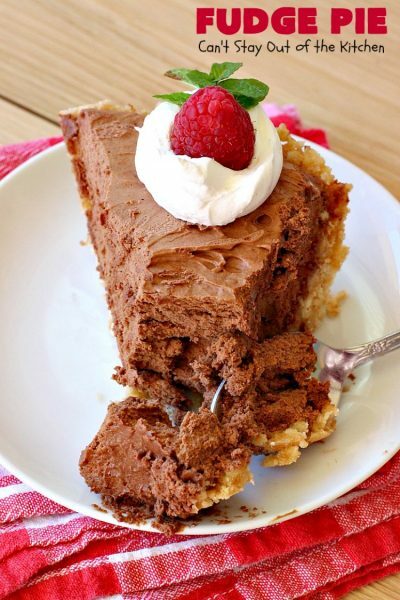 The filling is chocolaty, fudge and, oh, so delicious. 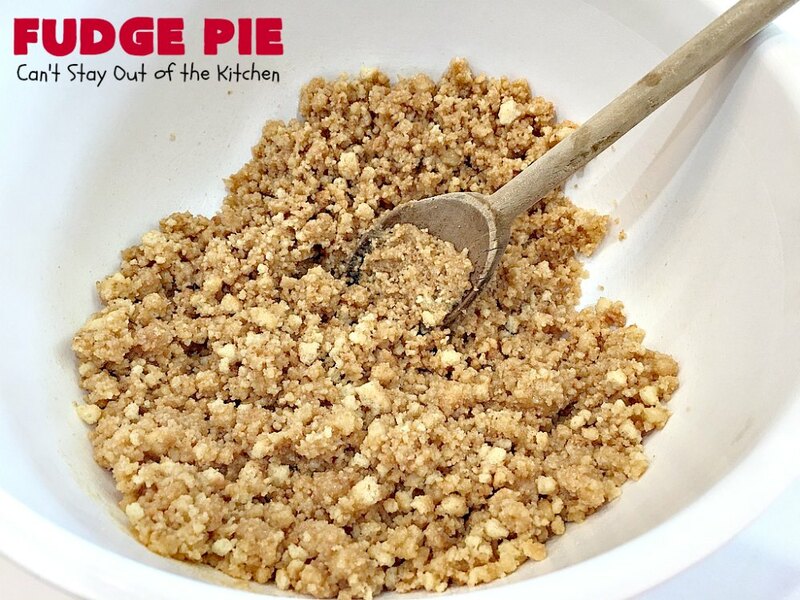 On top of that, this pie is actually pretty easy to make. The crust takes about 10 minutes. The pie takes about 10 minutes. Melting and cooling the chocolate takes about 10 minutes. Then the pie is refrigerated for six hours until it’s time to serve. Back in January, I made Texas BBQ Ribs and Stuffed Baked Potatoes for our Friday night care group. I had a good bit left over. I decided to serve it again to my oldest son and his wife for Sunday lunch. I added the Fudge Pie and Greek Salad. I ate way too much of this amazing pie. I couldn’t stop eating it. I had a large slice each day for several days afterwards! Back in the early 1990s John worked for the Baptist Convention of New England. One of the pastors in Portland, Maine, asked John to come up and speak on stewardship. After the service they hosted us and our two young children for lunch. I really don’t remember what was on the menu, except for this scrumptious pie. 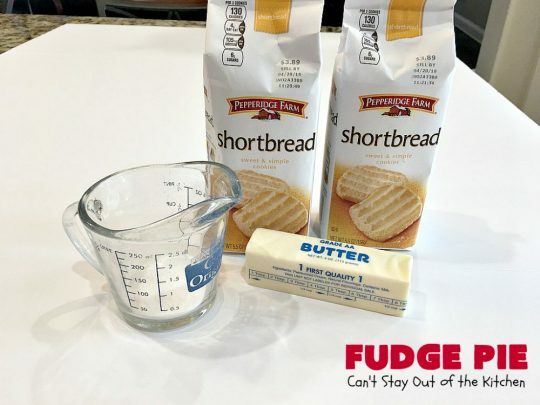 I asked Randy for the recipe. He wrote it out on a piece of paper from memory. I loved that pie. I have had that recipe collecting dust in my cookbook for over 25 years! I kind of forgot about it. But when I came across it again, I decided it was time to make it. Randy’s admonition was to use top notch ingredients. No margarine, only butter. Real chocolate. Real vanilla, no substitutes. And the best shortbread cookies I could find. Our family really enjoyed this pie when I made it in January. 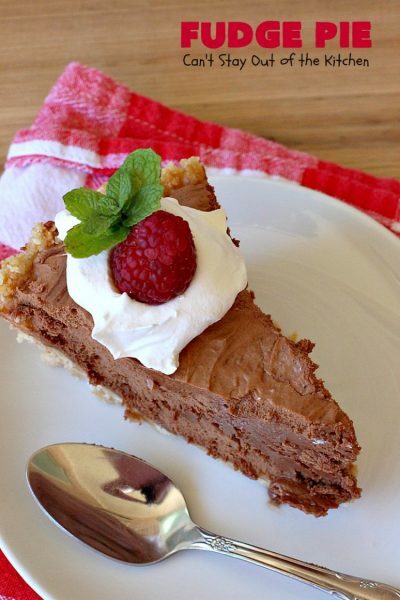 It’s a terrific dessert pie for holidays like Easter or Mother’s Day too. 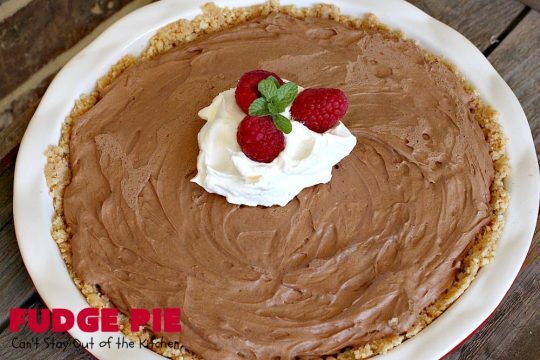 If you have family members who prefer pie over cake for birthdays, this is the pie to make! It’s really not all that difficult. 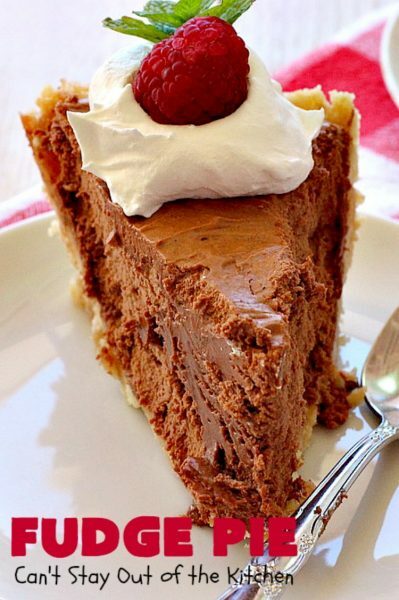 The texture starts out like a French Silk Pie. 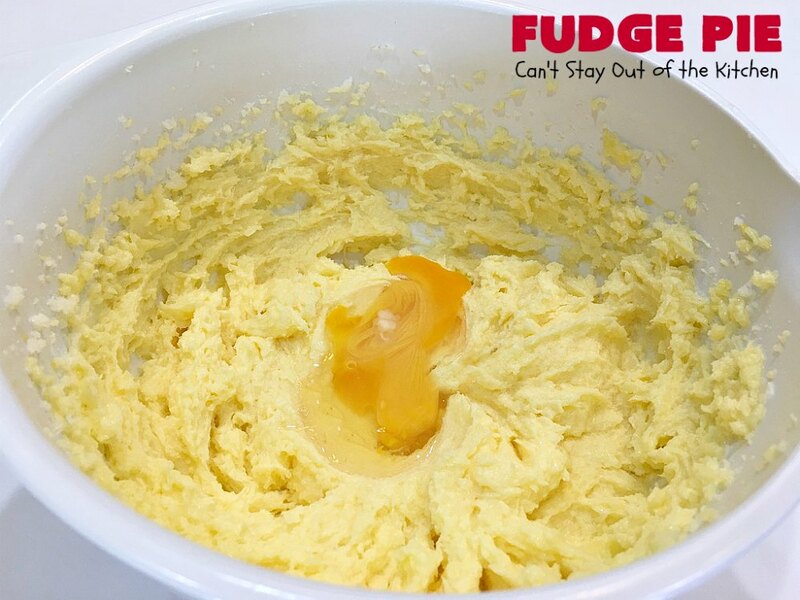 It gets thicker and more fudge-like after it refrigerates. 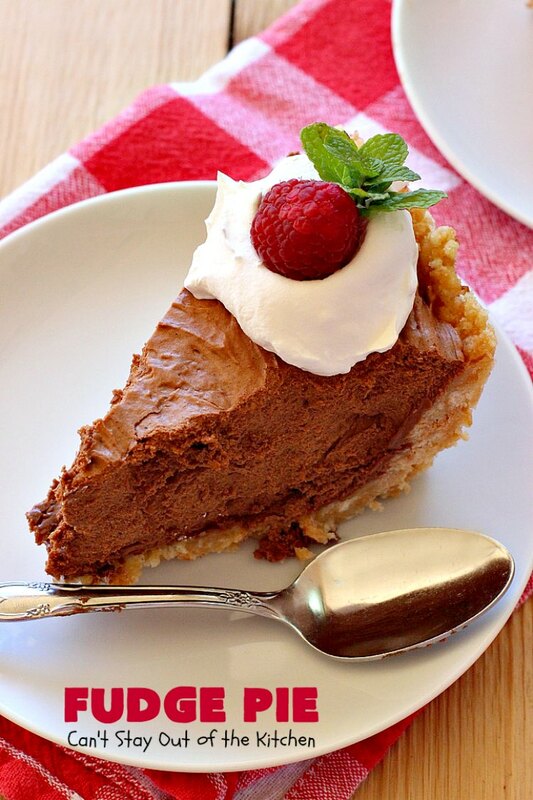 Seriously, Fudge Pie is rich, decadent and divine. You’ve just got to make it sometime soon. 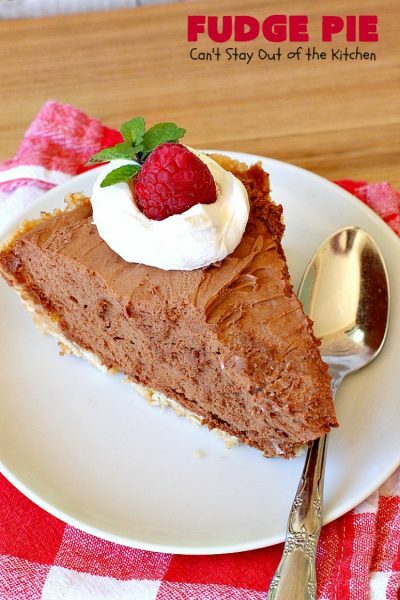 Fudge Pie is rich, decadent and divine! 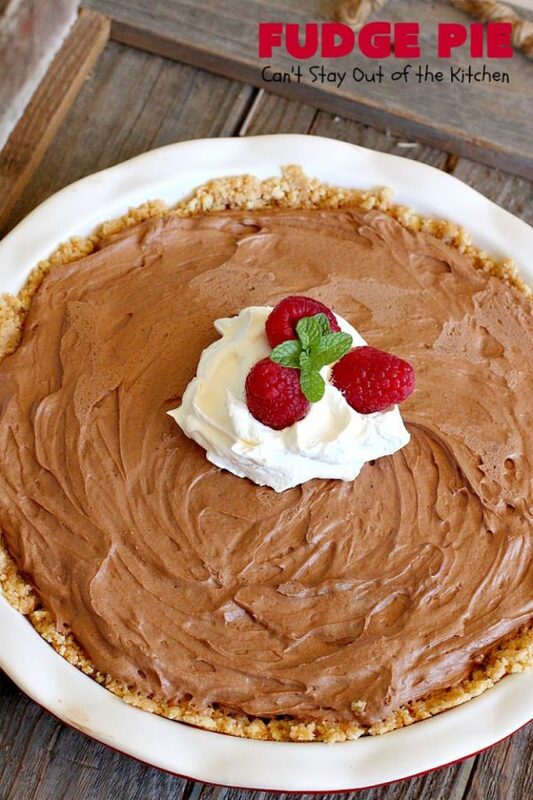 This is a terrific dessert for company or holidays. Seriously, every bite will have you drooling. I used these ingredients for the crust. 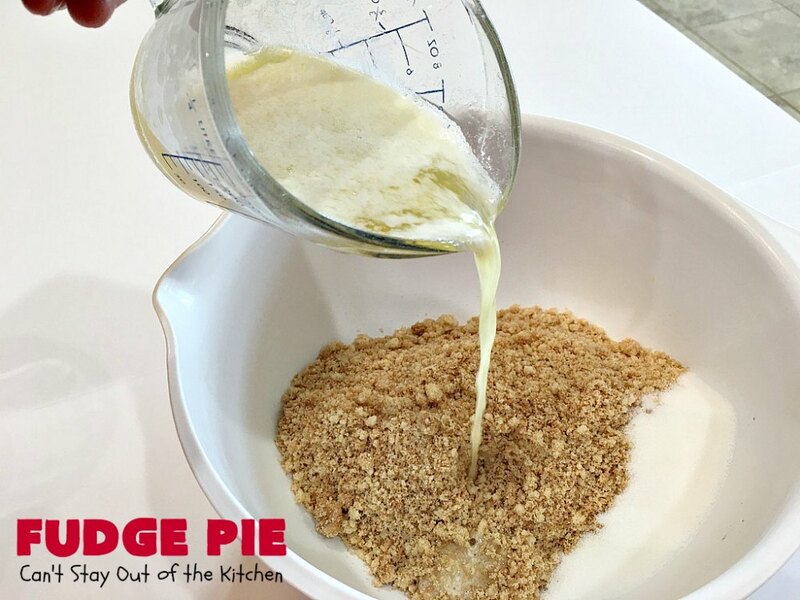 Pour shortbread crumbs into a bowl with sugar. Add melted butter. Press ingredients firmly into a pie shell. 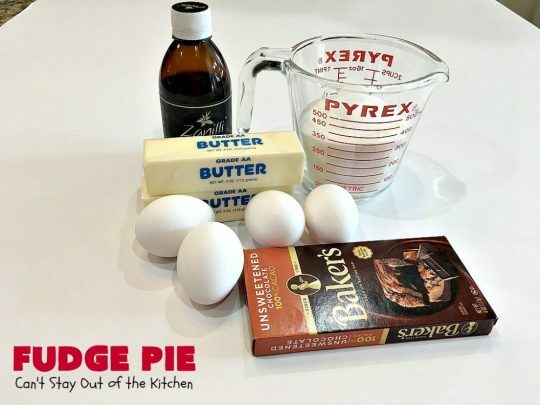 I used these ingredients for the pie filling. Cream with an electric mixer until fluffy. 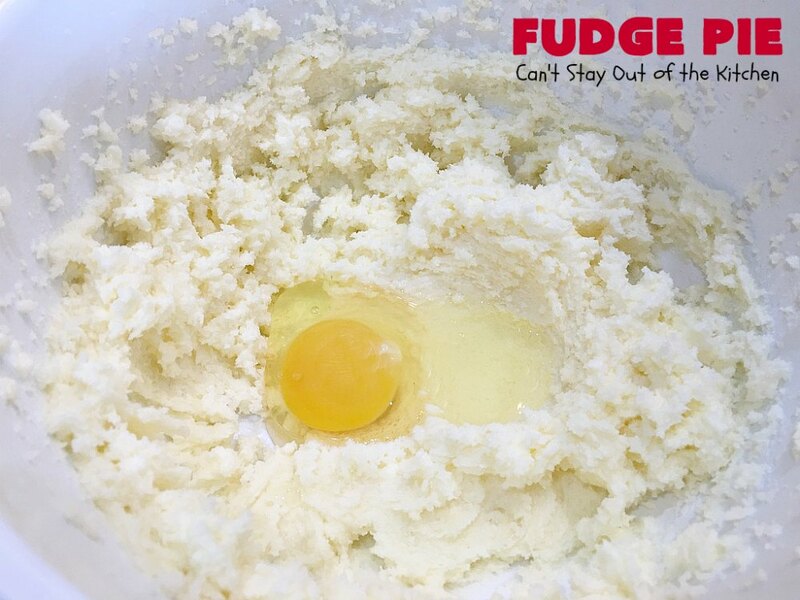 Cream mixture after each egg is added. Add the third egg and cream again. Cream mixture again until smooth. Add real vanilla extract, no substitutes. 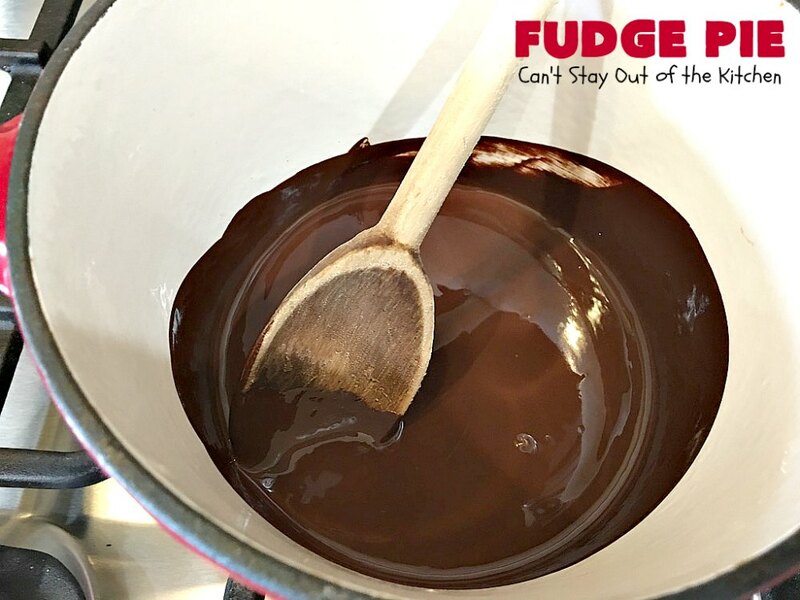 Melt chocolate in a small saucepan over low heat. Cool completely. Add cooled chocolate to butter/egg mixture. 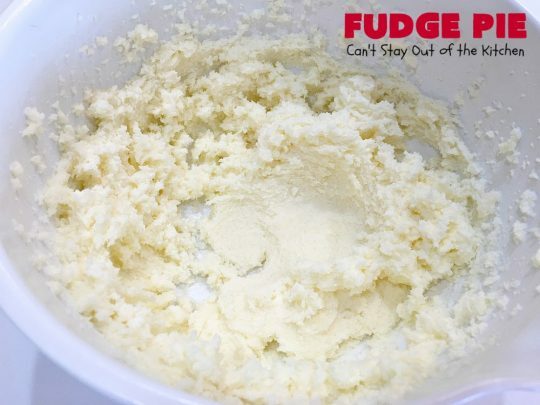 Beat fudge mixture with an electric mixer a full five minutes. 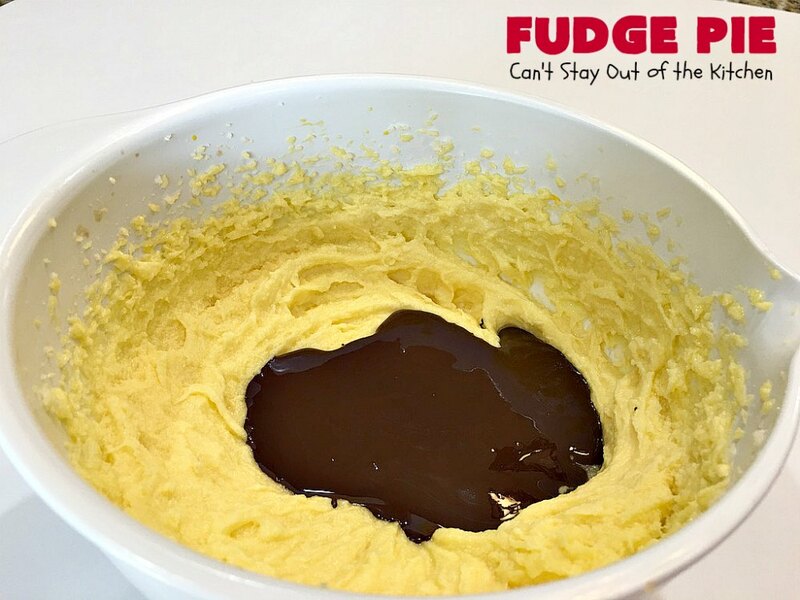 Pour chocolate fudge mixture into shortbread crust. Refrigerate until firm–about 6 hours. Serve Fudge Pie with Cool Whip. 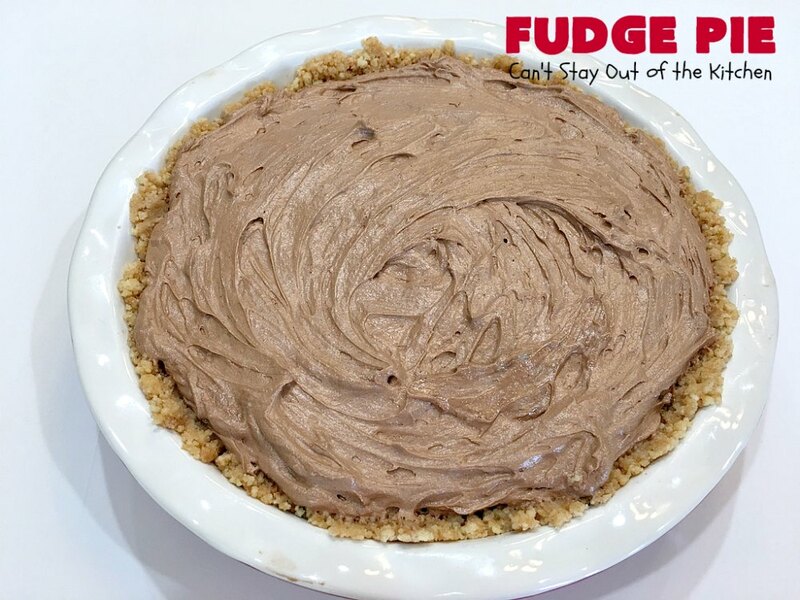 Fudge Pie will knock your socks off! 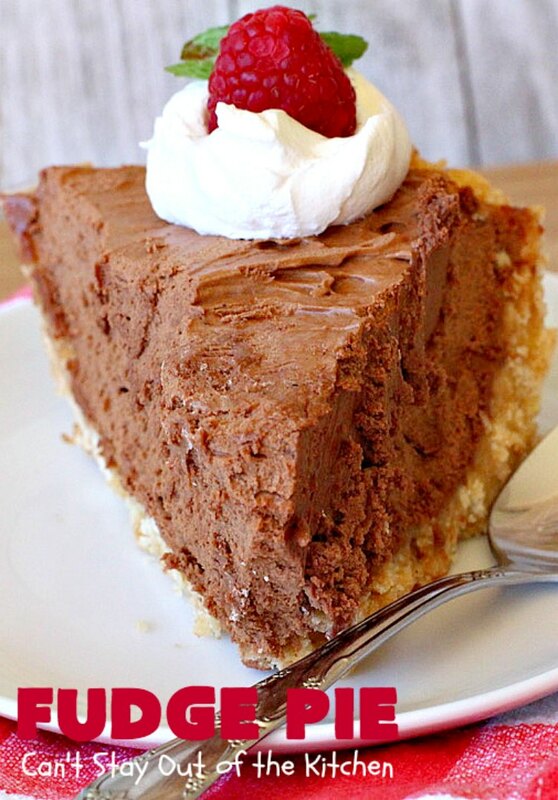 I loved the texture of this rich, sweet pie. This delectable Fudge Pie is rich, decadent and, oh so heavenly. Each bite will have you swooning! The texture starts out like French Silk Pie and then becomes more fudge-like after refrigeration. It's a marvelous dessert for company and holidays like Easter, Mother's Day or special occasions and birthdays. If you're a chocolate lover, you won't be able to get enough of this pie! 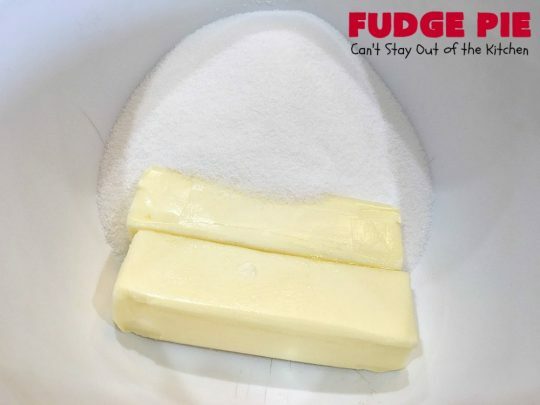 Crush cookies and combine with the butter and sugar. Add eggs, one at a time, beating until well incorporated. Add the extract and the cooled chocolate. Then, at high speed with hand or electric beater, beat the filling a full 5 minutes. 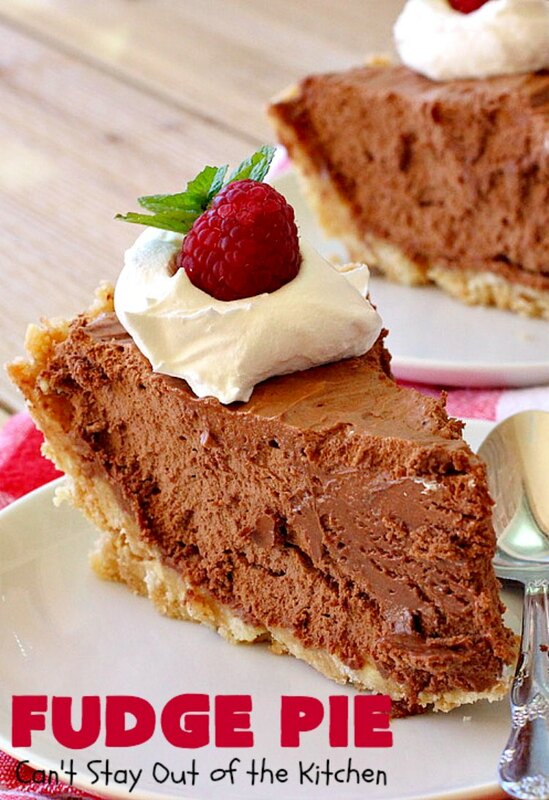 Pour the chocolate filling into prepared pie shell. Refrigerate until firm, about 6 hours. NOTE: I allowed the chocolate to cool at least 15 minutes. NOTE: You must beat the filling ingredients a full 5 minutes for the pie to set up properly. 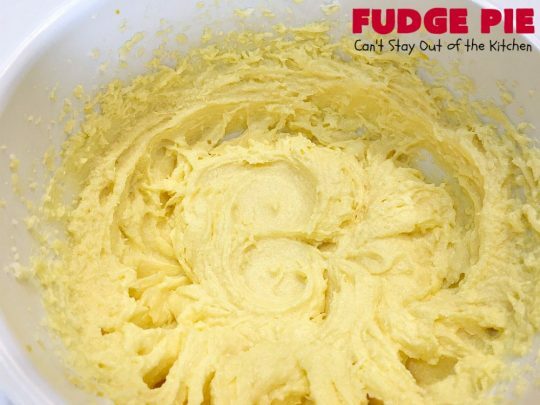 NOTE: Use the best available ingredients. No substitutes for real butter, chocolate and vanilla extract. Fudge Pie is wonderful for holidays like Easter, Mother’s Day or Father’s Day. If you’re a chocaholic, you’ll love this spectacular Fudge Pie. 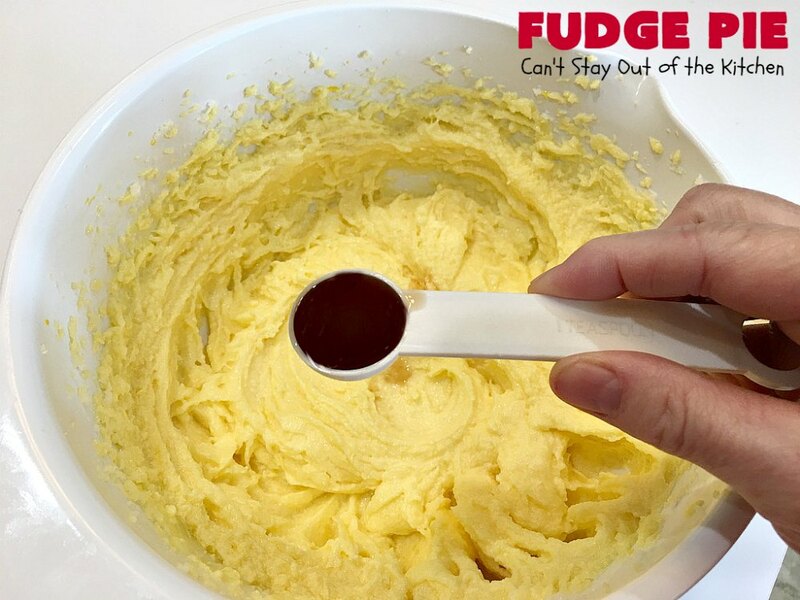 It’s time to grab a spoon and dig in! I have had such luck with Teresa’s recipes but this with the egg I was a bit leary. 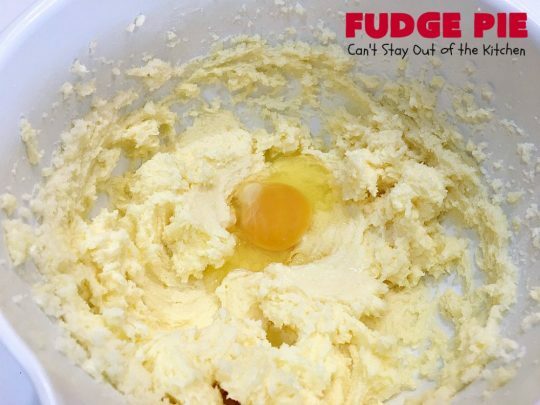 So glad to see helpful hints for working the egg into the fudge pie. Thanks for Teresa and all her posters. Will be trying on Easter weekend. Hi, Becky. This is one terrific pie. Hope everyone enjoys it as much as we do. Hey, Kim, you’ve gotta give this pie a try. It is absolutely so mouthwatering. I couldn’t stay out of it! This sound A-mazing! However, I’m not nuts about the raw eggs in it. Any suggestions? I assume something like pasteurized Egg Beaters wouldn’t work as that lacks yolks. Q: With the current warnings not to eat raw eggs, could you please tell me how to convert my favorite recipes for Key Lime Pie and French Chocolate Silk Pie? A: Recipes that call for uncooked eggs do put you at greater risk of foodborne illness. To adapt your recipes using cooked eggs, the American Egg Board suggests the following method: In a heavy saucepan, stir together the eggs and sugar, water or other liquid called for in the recipe (at least 1/4 cup sugar or liquid—or a combination—per egg). Cook over low heat, stirring constantly, until the egg mixture coats a metal spoon with a thin film or reaches 160°. 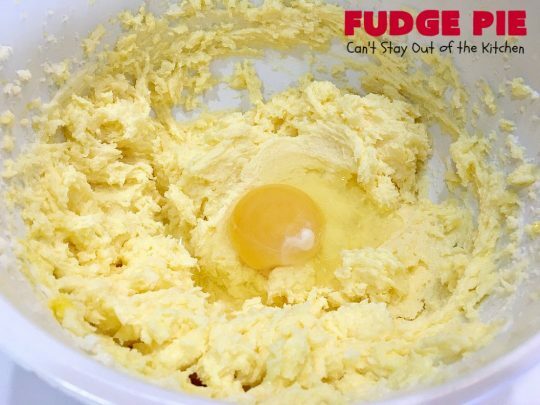 Immediately place the saucepan in ice water and stir until the egg mixture is cool. Proceed as usual with the recipe. For more information, visit the American Egg Board’s Web site at http://www.aeb.org. Kimberly, how nice of you to share! 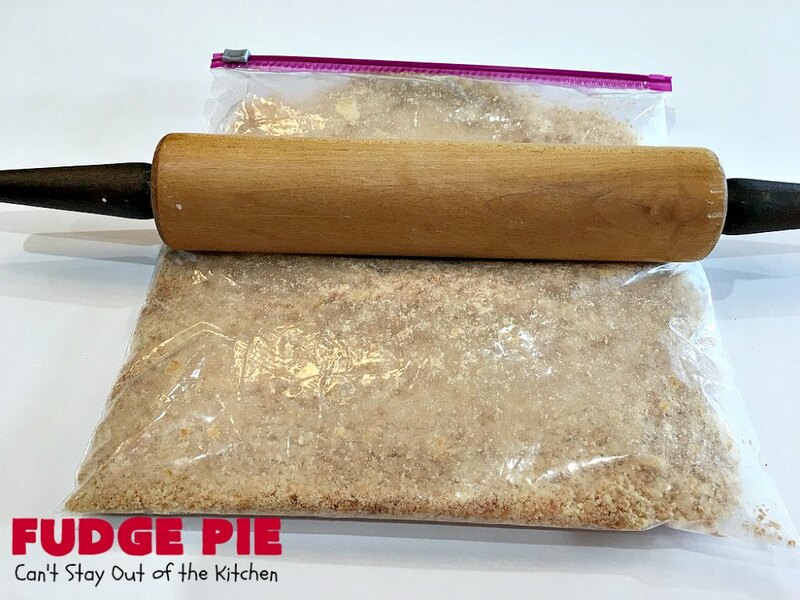 I had never heard of this method, and it’s a great technique to tuck in my recipe box. Hi, Mary. I know a lot of people are squeamish about raw eggs. I’m not particularly squeamish since I’ve eaten raw eggs in things for decades without a problem. See Kim’s reply on what she would do. I’m not going to say that that won’t change the taste or texture, but it is an alternative.